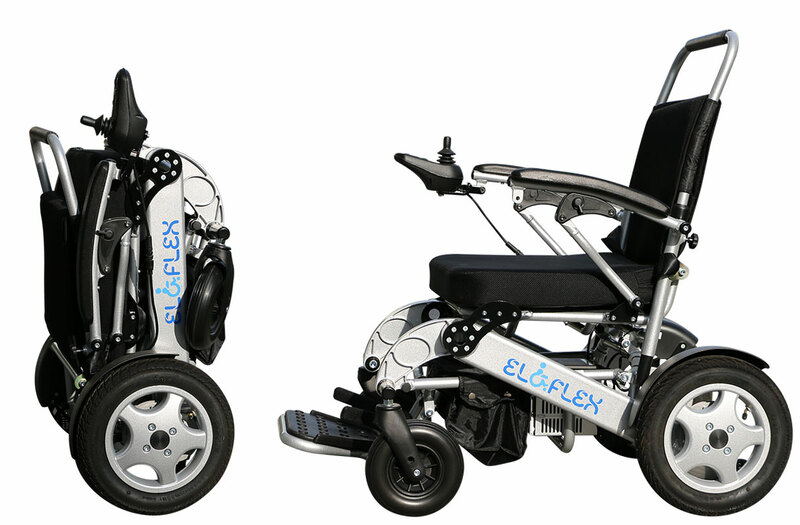 Eloflex M-Plus is our original model designed for people with shorter legs than average. With a slightly lower seat height, it makes it a bit easier to get into a comfortable driving position and to enter and exit the chair. 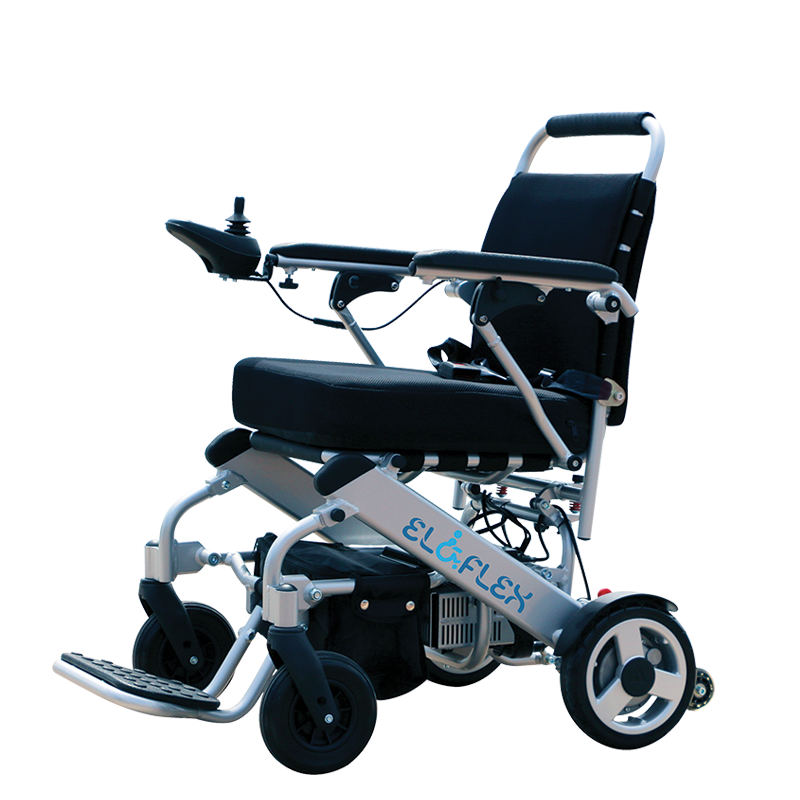 Eloflex M-Plus has a slightly lower seat height than our other models, and is therefore ideal for users who are shorter than 160 cm. 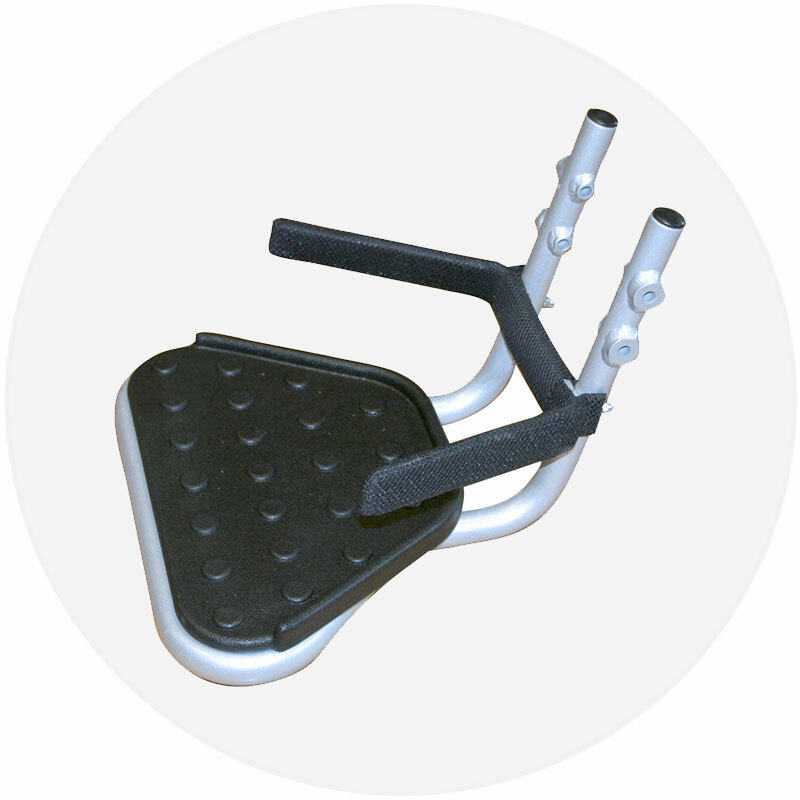 With this model, a user with slightly shorter legs can easily get into a comfortable and correct sitting position. The lower seating height also facilitates entry and exit of the seat, providing a good seating height at a dinner table or desk. The distance between the foot plate and the top of the pad is 45 cm. 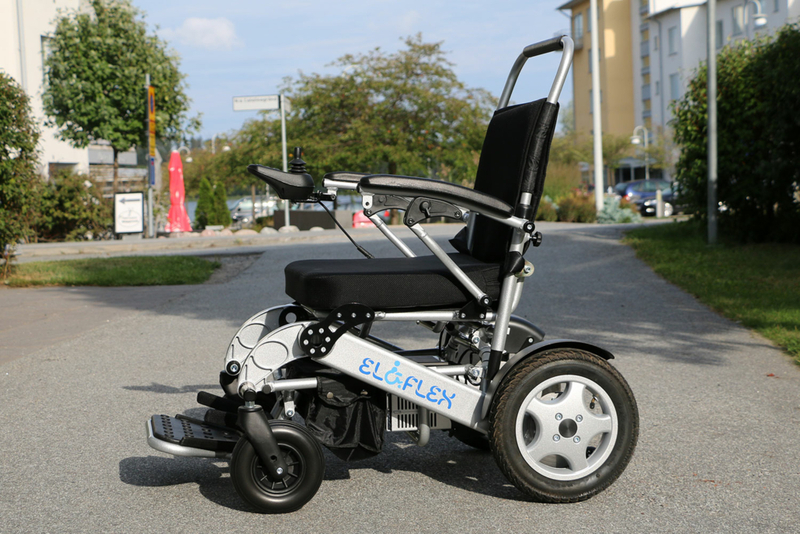 Eloflex M-Plus is also a popular model among our slightly heavier users. 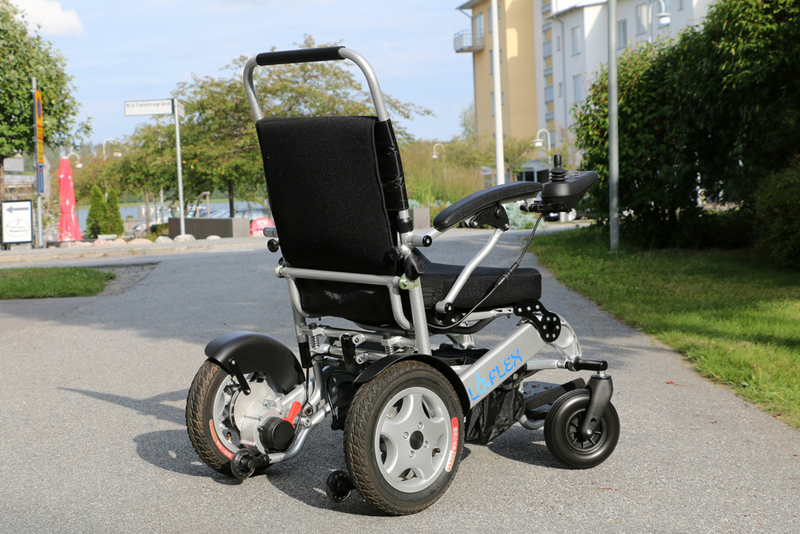 Due to the stable and robust frame, it can accommodate users weighing up to 150 kg. 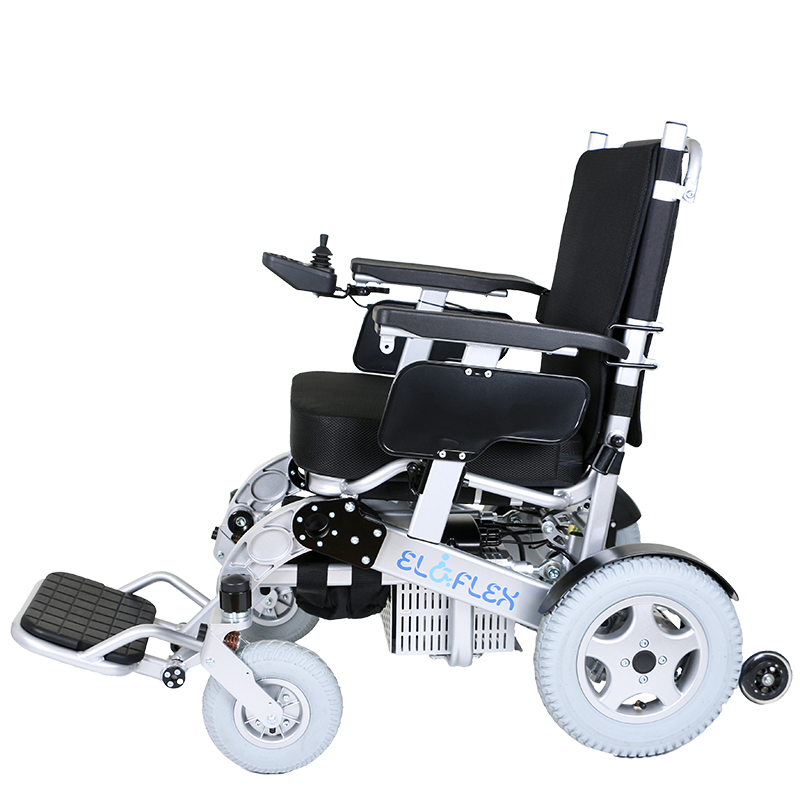 Despite the strong frame, the weight is still low and the model, like other electric wheelchairs from Eloflex, can be folded in a few seconds. As a result, it’s easy to take this model in your car, or on excursions by air, boat, bus or train. 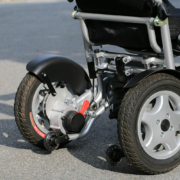 Large air-filled rear wheels provide comfort even on uneven surfaces. 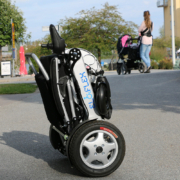 And with two rechargeable batteries as standard, you can drive up to 30 km and continue for more than five hours on a single charge. 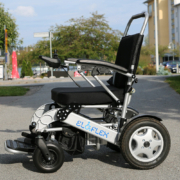 The most unique thing about all Eloflex models is that they can be easily folded in just seconds. 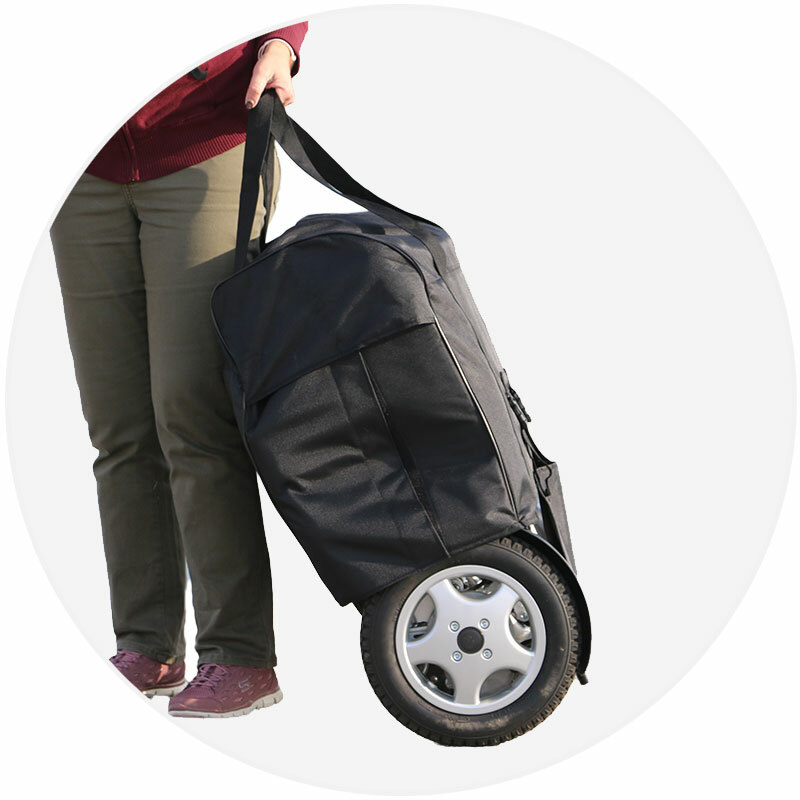 The compact design, combined with an ultra-lightweight aluminum frame, makes them easy to transport by car or plane. Two rechargeable lithium-ion batteries are included as standard on all Eloflex models. This gives you twice the power and range, allowing you to drive more than 30km on a single charge and securing more than five hours of efficient usage. 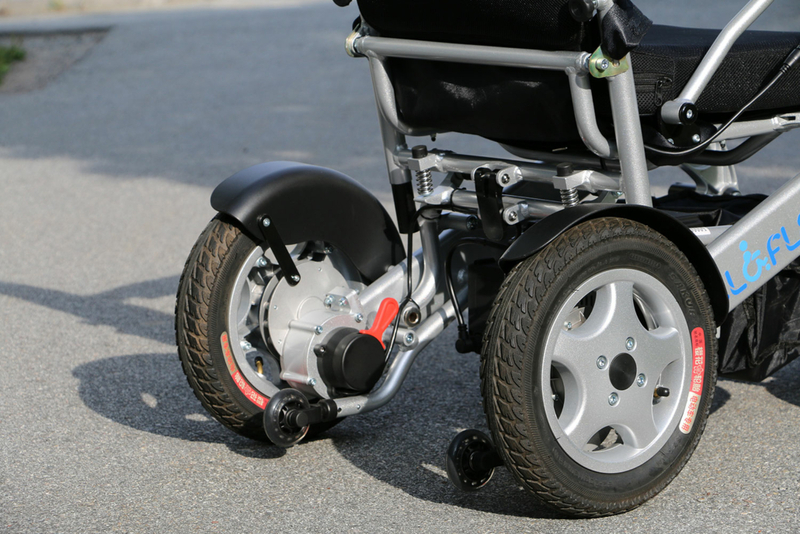 This model features large 12-inch, air-filled rear wheels, which ensure superior grip and accessibility regardless of the surface. 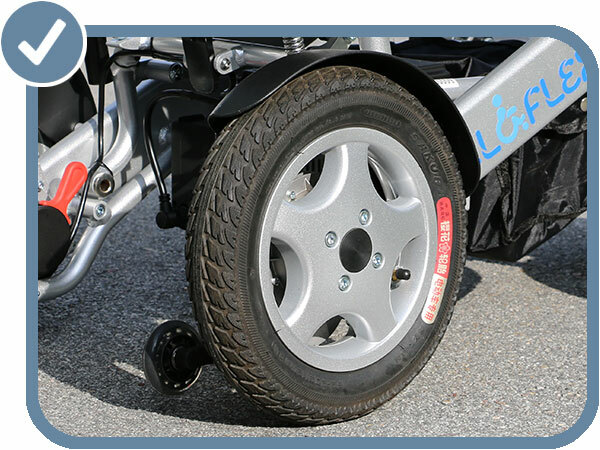 The heavy duty wheels also provide a more comfortable driving experience on uneven surfaces such as gravel roads and cobblestones. 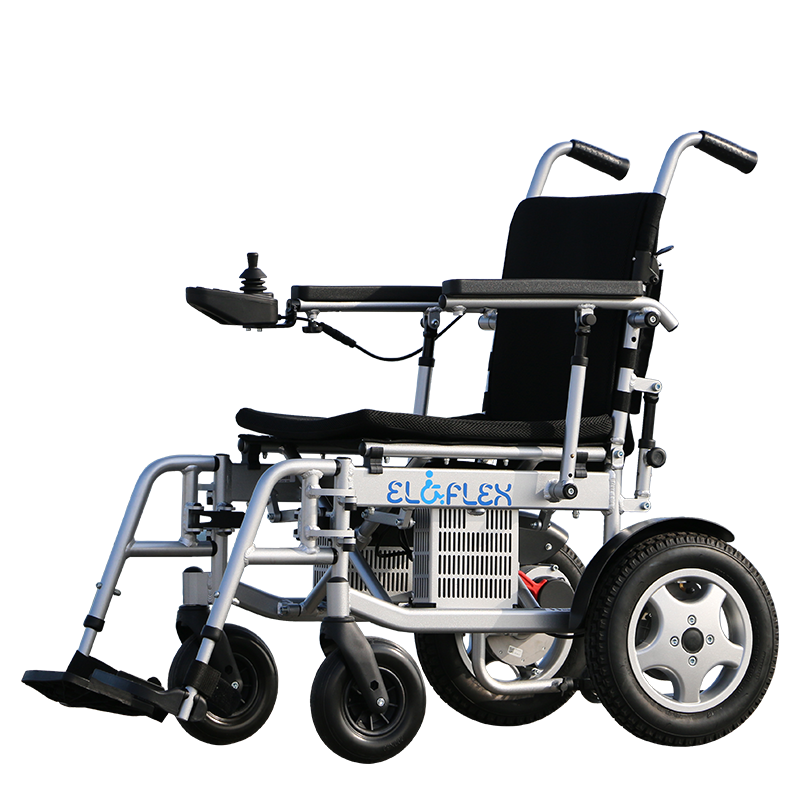 Model F is equipped with two powerful 250-watt electric motors. 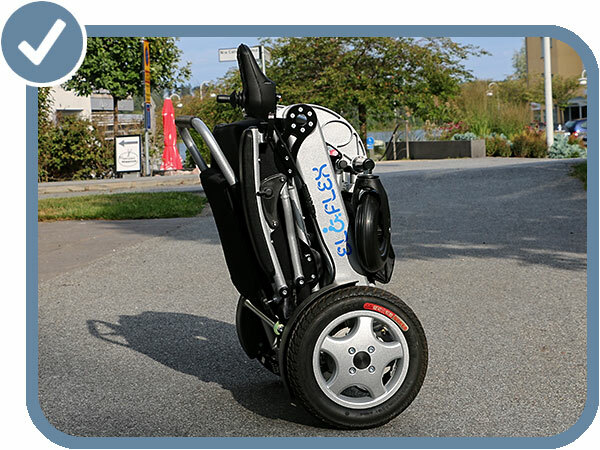 The technology is based on the latest brushless motor design, which draws less power and is lighter in weight. 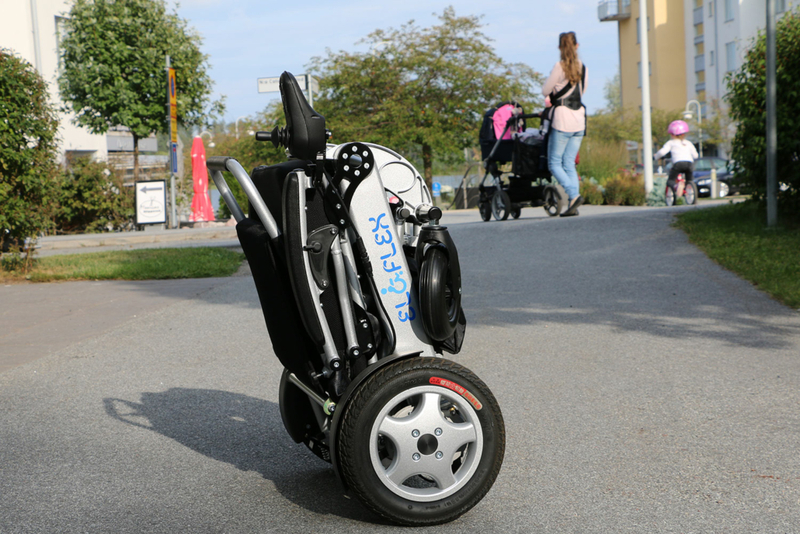 This ensures a longer driving range, good control and a better driving experience. To make it easier to get into and out of your seat, we’ve incorporated a handy flip-up function on both armrests. 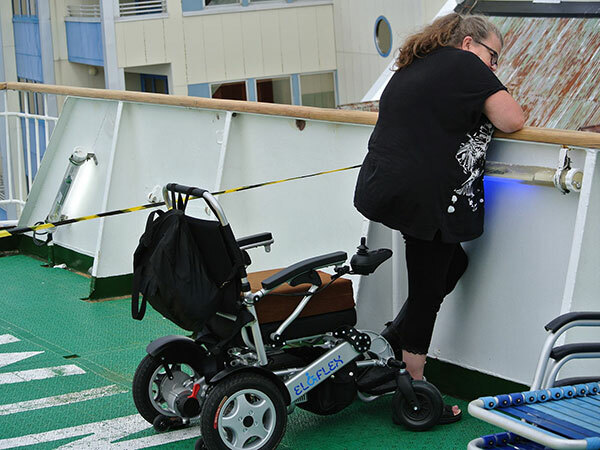 The footrest can also be folded up to ensure safer movement into and out of your Eloflex. Safety is a top priority for us at Eloflex. That is why all of our models come with an adjustable seat belt to protect you in the event of an accident. 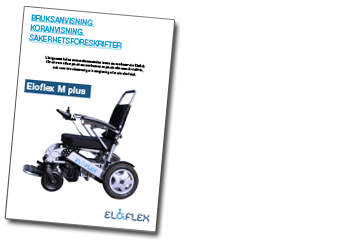 All Eloflex models are equipped with fixed anti-tipping protection to prevent the chair from tilting backwards. 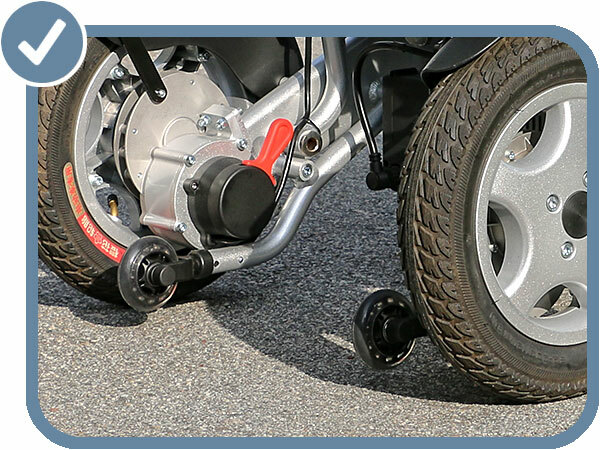 This secures a safer ride and reduces risk when navigating edges, curbs and sidewalks. For maximum hygiene, the back cover and case are removable and machine washable. There’s also a removable packing bag under the seat where you can store your belongings while driving. 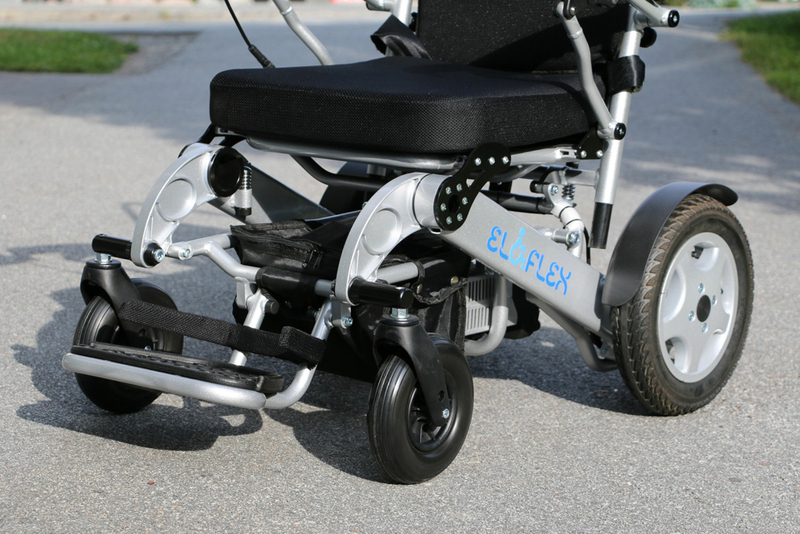 The care control is an arm and a bracket which means that you can mount the joystick on the backrest of your Eloflex. 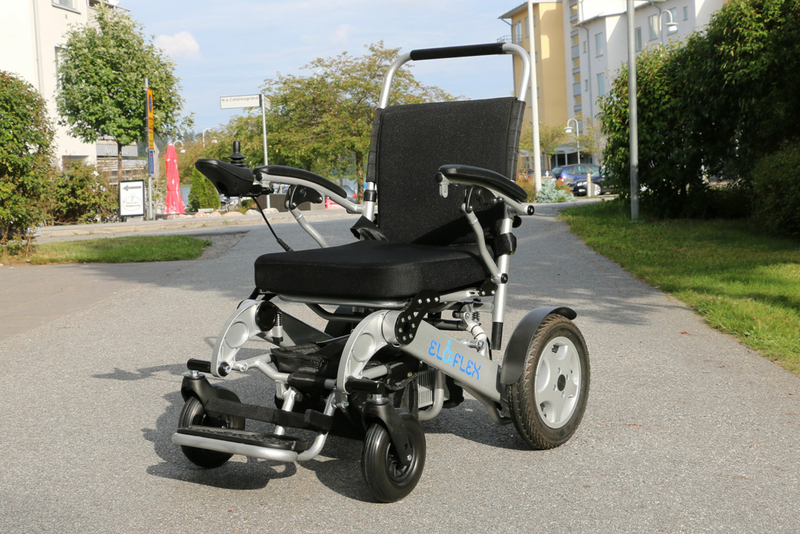 With the care control, the person who is behind can drive the electric wheelchair with the help of the joystick instead of the person sitting in the chair. 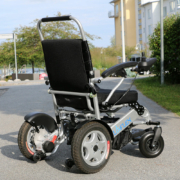 A perfect solution for older users and for certain medical conditions. 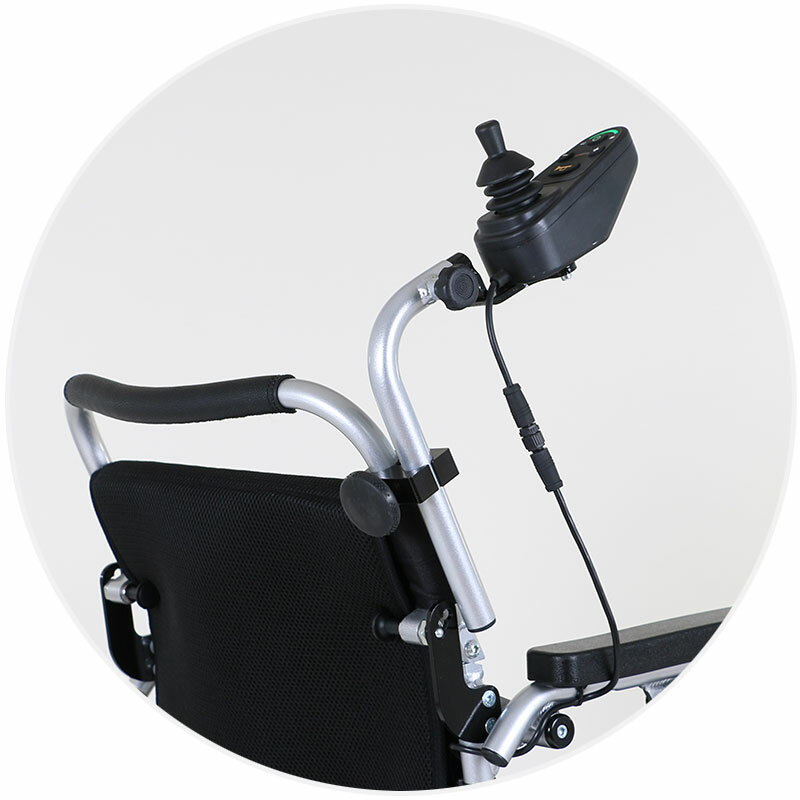 The headrest makes your Eloflex more personalized and useful, even for those users who need some extra support for the head and neck. 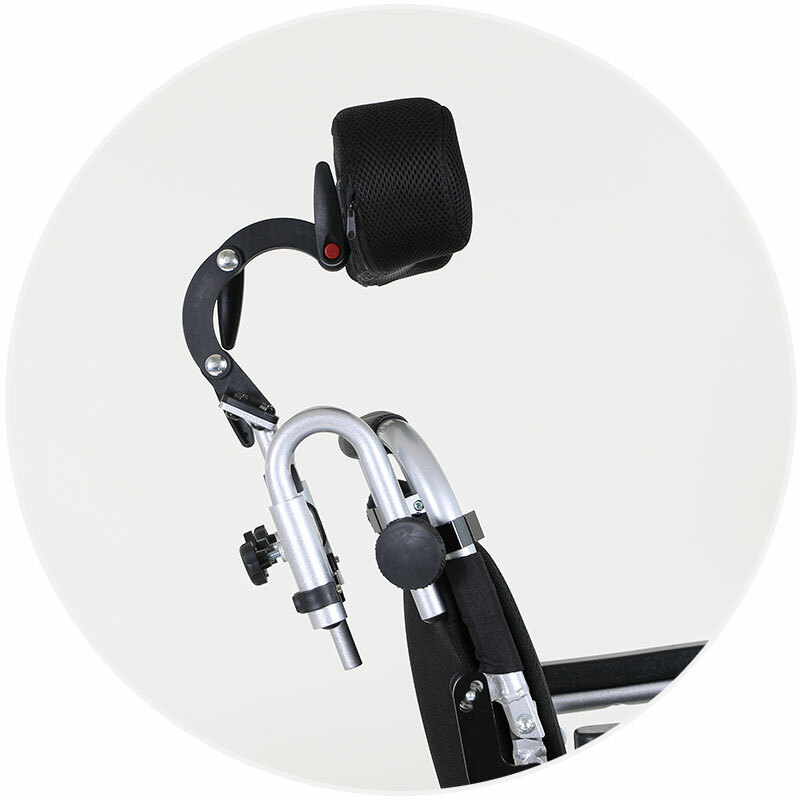 The headrest has large adjustment possibilities and can be adapted to each individual needs thanks to the smart attachment. 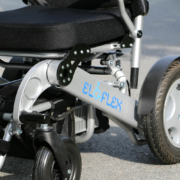 With a headrest on your Eloflex you get a comfortable sitting and driving position. 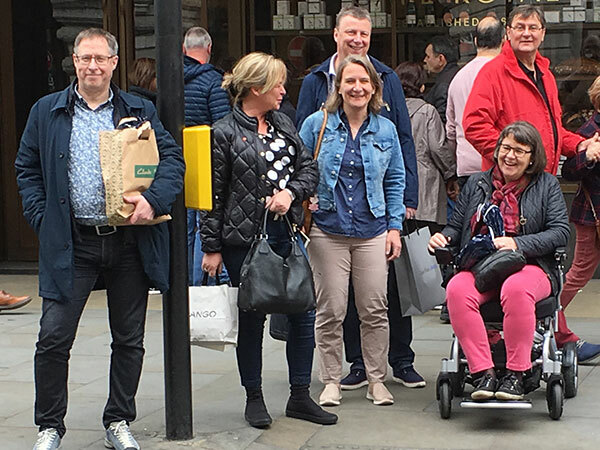 The bag is the perfect accessory for those who want to be a little extra careful of your Eloflex when transporting, when checking in on a flight or loading the chair in the car. The bag is black and made of durable nylon fabric. 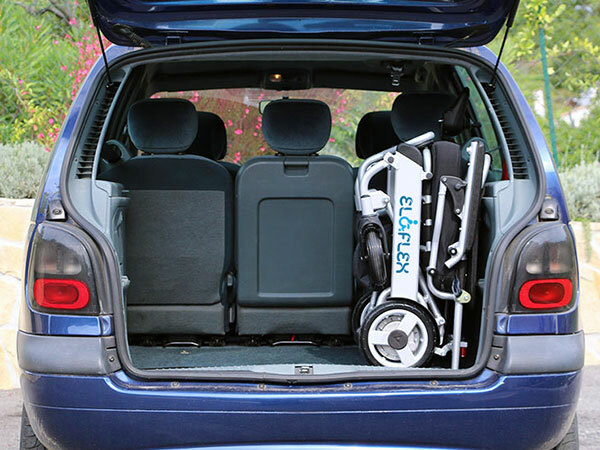 You put the bag over the Eloflex when you have the chair folded and attach it under the chair with the buckles. There are two handles on the bag. 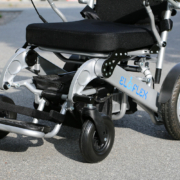 Now there is an adjustable footrest for Eloflex electric wheelchairs. 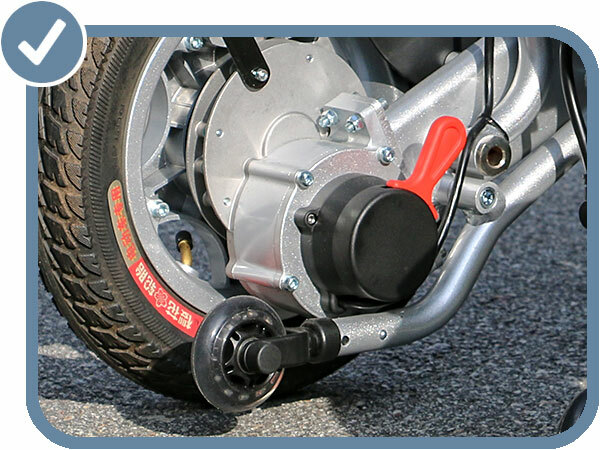 Double fasteners allow the foot plate to be mounted in two different positions and thus extend the distance by about 5 cm between the foot plate and the pad. Perfect for those with a bit longer legs than average. 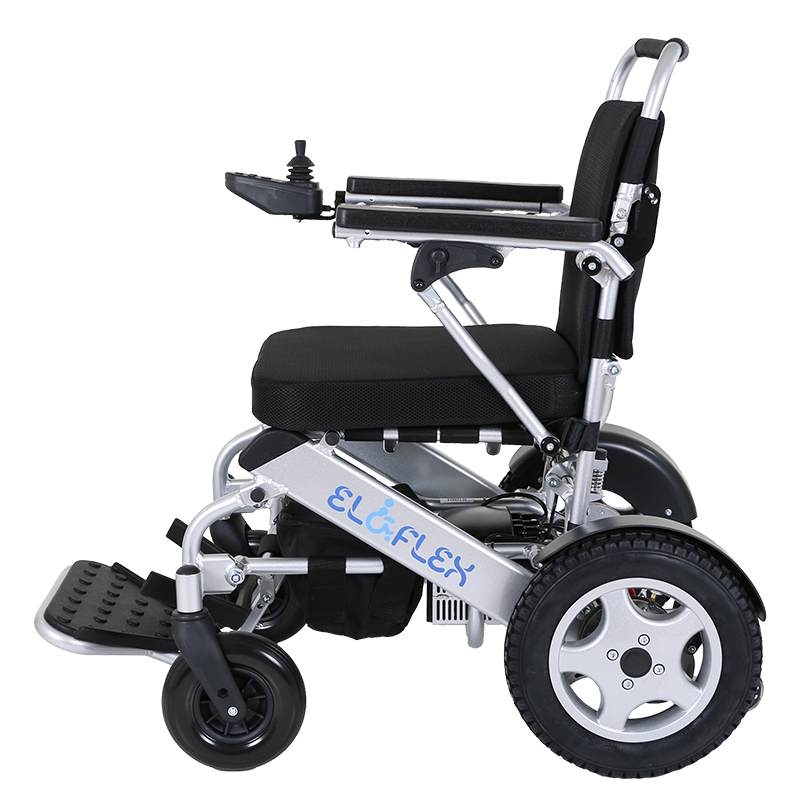 Eloflex footrests have soft calf support, an anti-slip plate and an edge to keep the heel in place. 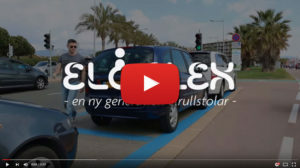 Eloflex is the smartest travel company on the market. 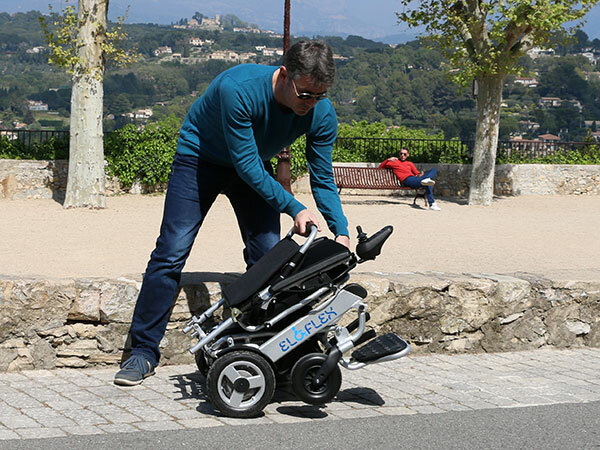 Flight-approved batteries, compact and smooth design and low weight and folding in seconds make it easy to take with you regardless of destination. 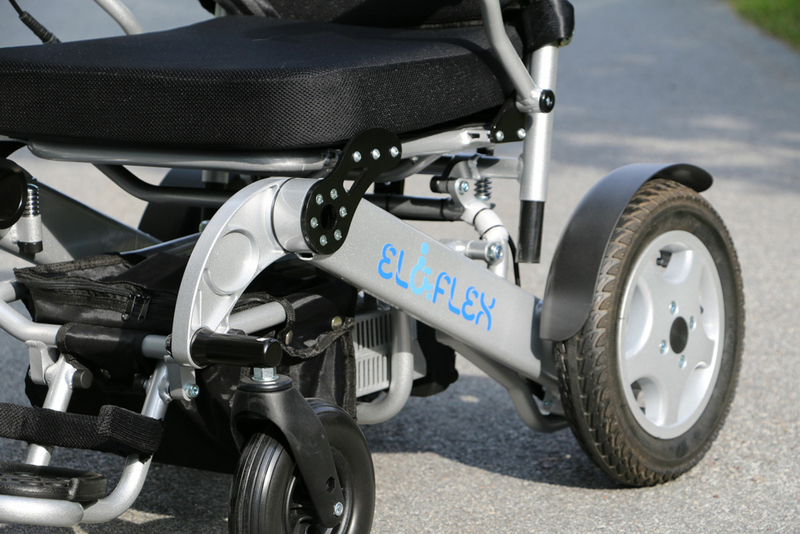 Eloflex is a smart electric wheelchair that you fold together with a simple grip in seconds. The low weight makes it easy to load into your own car. 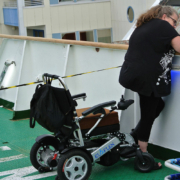 Now you do not have to be dependent on handicap transportation service. 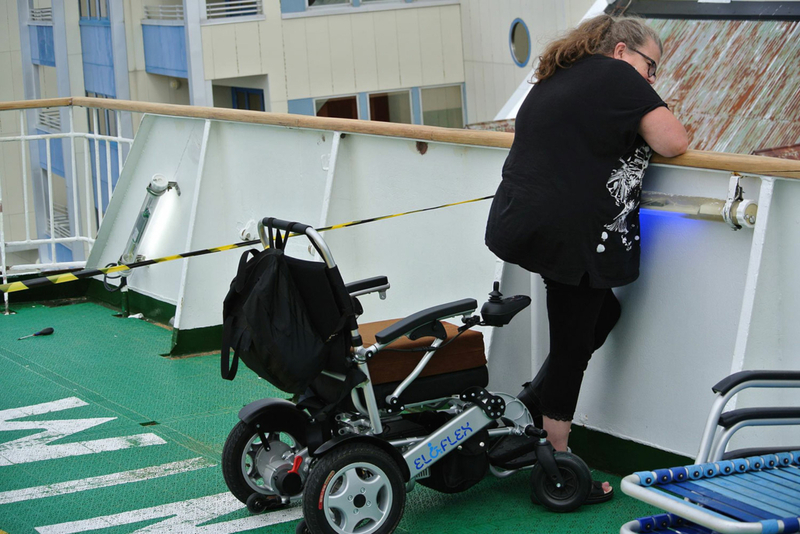 A folding electric wheelchair changes everything. Now you can fold it together and bring it in your own car and on the journey. Now you can store it in the closet, use a regular taxi, book flights and trains. 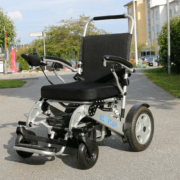 Finally a smart electric wheelchair.